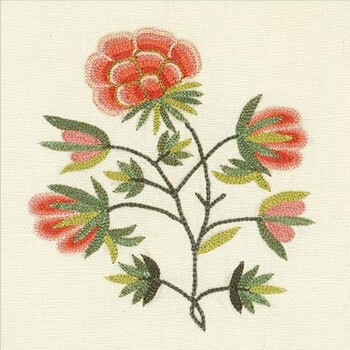 Embroidered Fabric – Perfect Inspiration! There are few of us – even the most avid needleworkers among us – who would undertake hand embroidering lengths of fabrics to use for household decor. That’s ok. There are companies that make beautiful (and quality) embroidered fabric, and sometimes, it’s just downright fun to browse through fabric and textile websites to enjoy a bit of inspiration without actually having to make the commitment to purchase yardage. I mean, we can dream, right? I bumped into just such a website yesterday. A beautiful place with beautiful embroidered fabric that I would love to get my beautiful paws on. 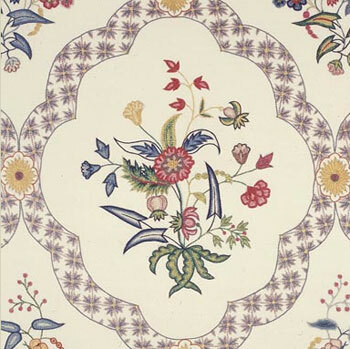 Lengths of embroidered fabric covered with vines, flowers, plants, animals, insects – browse through Chelsea Textiles and take a gander at the delectable offerings! 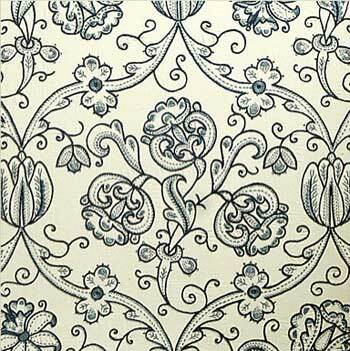 There are heaps of beautiful fabrics featured on this website, and with most of them, you can click on a link to see an up-close detail. … to gorgeous floral bunches – ah! They are all really beautiful! 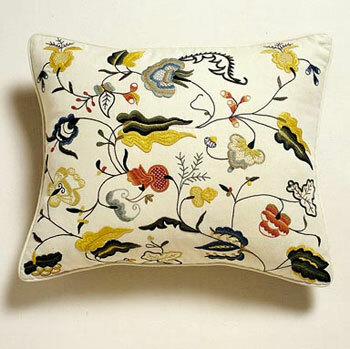 Besides hand embroidered fabrics, Chelsea Textiles also carries a line of nice printed fabrics. 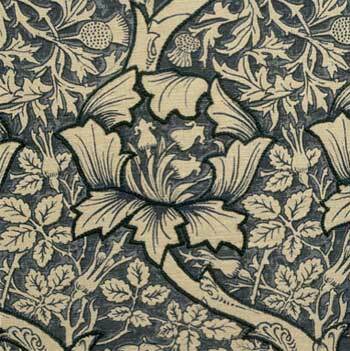 William Morris, anyone? And this is a sweet printed design – it would make an excellent embroidery pattern. Check out the knots in the flower center. Finally, the shop carries pre-made cushions and accessories that are pretty stunning, too. 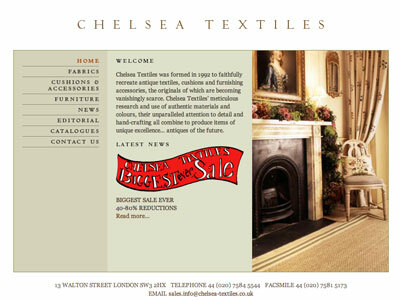 If you live in London or the vicinity, Chelsea Textiles is having a sale (40 – 80% off) through February. I don’t know what that means. Browsing through the website is a lot like looking at a menu without prices. You kinda get that funny feeling that things might be a bit beyond ye olde budget. But golly. Wouldn’t it be fun just to see them in person? To touch them? But even if you can’t do that, you can still glean a lot of inspiration from the fabric details on the website! So go browse and enjoy yourself! November 30, 2008 Time Sensitive: Building Your Needlework Stash? I love your site and look at it most days – have to remember the time difference here in the UK when I try to read today's blog at 8am! I have a problem which I hope you or your readers can advise me on: due to our cold winter I have chapped hands and fingers and I love to sew with silk thread, which of course catches on my rough fingers. I use lots of hand cream to no avail. Any suggestions would be most welcome. Scrummy, yummy fabrics. I actually bought a delicious embroidered fabric remnant from an op shop today. Just a simple thing I like to do for cards, pincushions, needle books etc for our Guild sale table is to embroider over a print. Whether a floral bunch or a pattern, the added dimension can be very attractive. Thanks for the web site and the teasing pics. It's 20 to midnight here now so will feast on Chelsea Textiles tomorrow. Don't you love it when you find a treasure at op shops? (Well, we call them "thrift" shops here). I'm sure you'll make something really exciting out of it! I use olive oil when I do this, but you can actually use regular vegetable oil. It doesn't smell that great. If you have any essential oils – lavender or whathaveyou – you could always add a drip. You can even make the stuff up in advance, and keep it in a little covered jar, so you can scoop a little out throughout the day and give your hands a treatment. The problem will be practically solved after the first use, but if you continue with it for a couple days, it'll be well and truly solved! Interesting. I have been browsing for Jacobean deasigns for inspiration for a while now, and I have seen a LOT of those designs online, on bookcovers etc, so I'd ventrue that they were reproducing historic designs for machines. I, too, stand behind the Olive Oil and Sugar treatment. I was just flabergasted the first time I tried it — having lived so long with dry, coarse hands. And thank you for the website. Fabric design is such a mother lode of embroidery pattern (especially crewel). Sometimes you can even "over embroider" already-embroidered fabrics and that makes it really unique and amazing! The viewers don't know what was already embroidered, so they figure you did it all!! TaDa! I do something similar, depending on the price of the ingredients and how thick you make it you can also use it allover, and I make a slightly different formulation to use on my face! You can also use salt as the exfoliating ingredient (stings in any nicks and cuts, but is good for the skin chemistry) add honey for added moisturisation, and use any oil you can cook with. I sometimes add cold pressed avocado oil (very moisturising) sweet almond oil, ground almonds for exfoliation, vitamin e oil from the health food store, and essential oils. Tea tree, chamomile, sandalwood, rose and lavender are all good for the skin, and tea tree and lavender are antiseptic and will help it keep. You made me laugh! I clicked your link before I'd made it back to read the rest of your blog. "You kinda get that funny feeling that things might be a bit beyond ye olde budget. But golly. Wouldn't it be fun just to see them in person? To touch them?" Mary, these are gorgeous and inspirational. 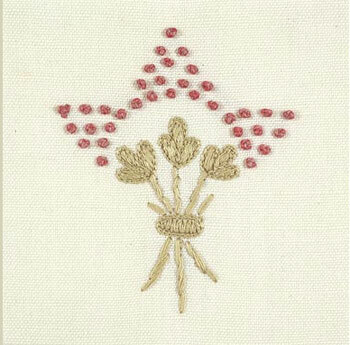 And I love Kath's idea about embroidering over on image on a printed image. I'm going to let that rattle around in my brain for awhile, and maybe I'll come up with a little project for trying that. Thank you all and especially you Mary for your advice on rough hand treatment. I've tried it and know now that it works. Those fabrics are soooooo gorgeous! Sad to say, but I have a fabric addiction that outweighs my embroidery addiction. The problem is that a few yards of fabric take up so much more space than all my embroidery stash put together! 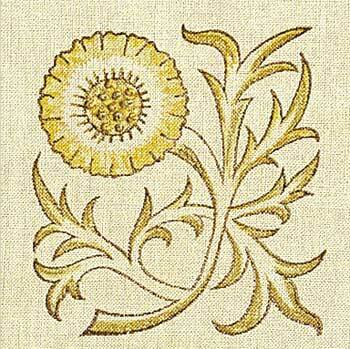 I have sewn pre-embroidered fabrics, though, with spectacular success. Although I've never laid hands on anything as yummy as these look, I inherited a lemon yellow piece of linen with lovely yellow daisies (they were done by machine) that was just the right amount of fabric for a little girl — but I was able to stretch it to make a very classically styled short-sleeved jacket. Every time I wear it, I get compliments and the kind of admiring glances that make me feel like I have a much larger bank balance than I really do, LOL. I also once made a silk evening dress for a wedding that had an empire waist and, because it was for a very special occasion, I made simple bullion roses following a diamond grid. All evening, I had women pretending to tuck in the tag on my dress (there wasn't one since I dislike sewing them into something I've made myself on grounds of general scratchiness). Not that I'm encouraging anyone out there to commit the sin of encouraging other women's envy, but… I just don't think embroidery should be limited to pictures under glass. On the topic of dry hands, I discovered by accident (a capsule got stuck and spilled all over me when I tried to dislodge it) that the flax-seed oil sold as a nutritional supplement is the perfect skin conditioner. It soaks into the skin almost immediately, and, after a few days use, my hands are as smooth as they were when I was but a wee lass. Even the needle holes I get in my finger tips seem to heal faster when I "take" my flax-seed oil every day. Hello Mary! Tons of Thanks to you for those free embroidery tutorial videos. Though I don’t get much time to embroider I teach women in rural India make new products by reinventing old motifs on dresses etc. That gets them work throughout the year in an ever changing market.Their understanding is better when they see these videos.Keep up the good work. Previous Previous post: What Do Hand Embroidery and Canned Foods have in Common?